This section explains what you need to know about participation and vesting. Both depend on your hours of service and how long you stay in covered employment. It also explains how your Plan counts different types of hours of service when determining whether you meet participation and vesting requirements. To receive any of the benefits offered by your Plan, you must first become an active participant. Most benefits also require that you stay in covered employment long enough to be vested and meet specific eligibility requirements. You become an active participant by working at a job covered by the Plan for at least 750 covered hours over two consecutive calendar years (375 covered hours if you are a seasonal employee working in the food processing industry). You continue as an active participant as long as you work at least 250 covered hours each calendar year. Vesting means you have the right to receive a future benefit from your Plan when you retire whether or not you stay in covered employment. Once you are vested, you are protected from a forfeiture or complete loss of Plan benefits. You can start receiving your retirement benefit as early as age 55 (or sooner if you qualify). In addition, if you are vested and die before retirement, your family receives death benefits from the Plan. If you have a forfeiture of service (explained in Losing and Protecting Benefits), all your years of vesting service up to that point are lost and don’t count towards meeting the five-year or the ten-year vesting rule. You become vested when you complete five years of vesting service. One of those years must be after 1990. 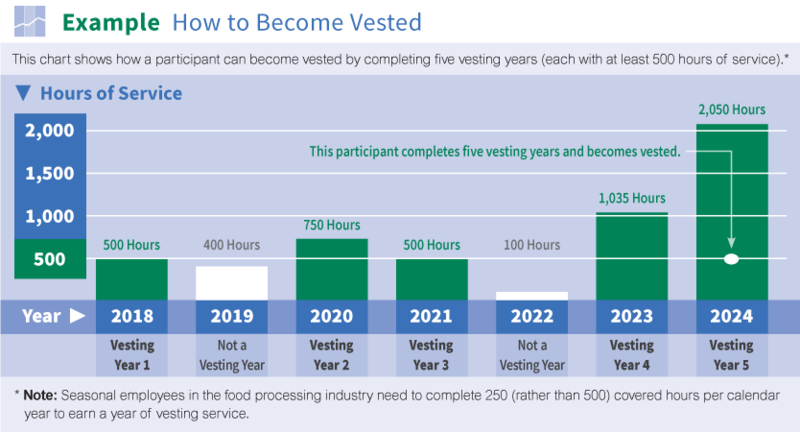 If you don’t earn any years of vesting service after 1990, you fall under the Plan’s 10-year vesting rule and will only be considered vested if you completed at least 10 years of vesting service before 1991. If you are not vested when you reach normal retirement age (usually age 65), a special vesting rule applies. Under this rule, you are considered vested if you are an active participant at any time after age 65 (or if later, on the second anniversary of your first covered hour under the Plan). Click here for an example of how a participant becomes vested. A year of vesting service is a calendar year when you earn at least 500 hours of service. If you are a seasonal employee working in the food processing industry, the minimum is 250 covered hours per calendar year. Remember, no matter how many hours of service you earn in a given calendar year, you can only earn one year of vesting service for that year. Your Plan participation, vesting, recent coverage, benefit eligibility and benefit amounts—all depend mainly on how many hours you work, the type of job you work in, and whether your employer is required to contribute to the Pension Trust for those hours. Different types of hours may be counted for these purposes so you need to understand the various kinds of hours of service your Plan recognizes and how those hours are counted. For vesting, the Plan recognizes your covered hours and several other types of hours of service. For most other Plan requirements, it is only covered hours that count. Covered hours are important. Click here to see how they work in more detail. Click here to learn about other types of hours of service recognized by the Plan such as non-covered employment, disability absence, military service and non-covered Teamster work. There is a special vesting rule that allows older participants who enter the Plan as part of a new group to vest more quickly. Under this special vesting rule, if your new group enters the Plan on or after January 1, 2002, you may be able to count your years of unbroken employment as years of vesting service. Unbroken employment is your continuous employment with your employer up to your first covered hour and is similar to continuous past employment. Click here for more information about continuous past employment. You must be age 52 or older on the date the group enters the Plan. Under this special vesting rule, you become vested when the combination of your years of unbroken employment plus your years of contributory service equals five. However, the years of unbroken employment that can be counted for this special vesting rule depend on your age on the initial date your group enters the Plan. Click here to see the maximum years of unbroken employment that can be counted as years of vesting service under the special vesting rule. If you are working for a covered employer but your job is not covered by the Plan, each regular-time hour that you work can count as an hour of service. These hours of service are called non-covered employment. Hours of non-covered employment count toward vesting and help protect you from a complete loss of Plan benefits (see Losing and Protecting Benefits). They do not count for any other purpose. For example, if you work at least 500 hours of non-covered employment in a calendar year, you earn one year of vesting service. You can only earn one year of vesting service per calendar year. The work you perform must be work for which your employer compensates you. Overtime hours and time off (other than paid holidays and paid vacation) do not count as hours of non-covered employment. 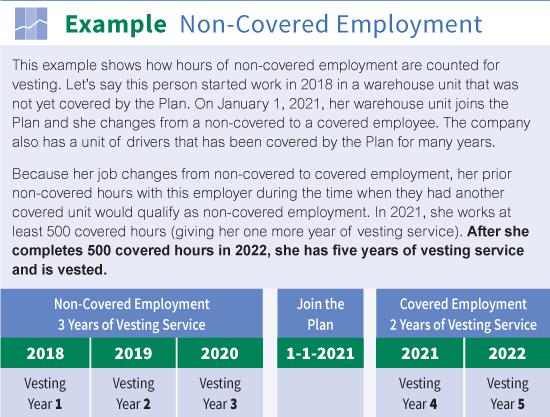 Note: Any hours worked for your employer before the year in which that employer first has a covered unit in the Plan, or after the date the employer ceases to have any covered units, do not count as non-covered employment. Also, after your employer has no more covered units in the Plan, time you work for that employer does not count as hours of non-covered employment. Click here for an example that shows how non-covered hours are counted for a sample participant. Your Plan benefits are portable. Not all of your covered employment has to be with the same employer or in the same job or location. You can change jobs, locations or local unions and continue to earn Plan benefits as long as you stay in covered employment with a covered employer. If you need to change jobs or stop covered employment, it’s a good idea to check first with your Administrative Office to see how your benefits may be affected.